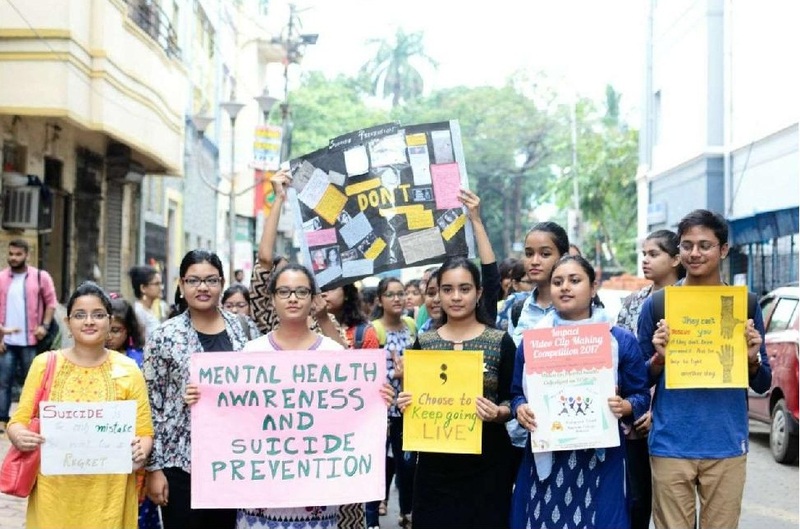 On the 16th of November, 2017, students of the Department of Psychology, Asutosh College carried out a mental health campaign on “Suicide Prevention among Youth” around the college campus, advocating the causal factors, risks, outcomes and preventive measures of suicide among people. All the teachers of the department took part in the campaign, as well as some non-teaching staff. The students were from 1st, 2nd and 3rd years, who participated with a mission to spread the knowledge of suicide among the Asutosh family. The various students from other departments who were present outside were curious to know the outcomes that an impulsive mistake like that of suicide could bring to their near and dear ones. We explained to them that youngsters and youth from our age groups were the most vulnerable due to the various pressures and demands that are contingent on us from primary and secondary groups. We also spread awareness about getting help from professionals in such a case, if no other option was available. We elaborated a few recent cases where college and university students had committed suicide due to educational bias and political issues, and how these could have been avoided with little care from others. We explained the “IS PATH WARM” mnemonic to them, provided by the American Association of Suicidology to help near and dear ones remember the warning signs of suicide. We also went to the staff rooms in the main and annex buildings where we distributed badges to teachers as a souvenir to our effort, and as a reminder of getting help in case of distress. Apart from this, we distributed badges to everyone we met in the campus, from students to non-students. After this, we had an interacting session on psychopathology with Prasanta Roy, Assistant Professor, Department of Clinical Psychology, Institute of Psychiatry. The campaign was concluded by a colour therapy session by Dr. Tinni Dutta, who interpreted the various aspects of student’s drawings.